After almost 2 years of back and forth, our stainless steel prototype frames have been fabricated. They are now at Toussaint Global HQ in Calgary, built up and ready for some serious test riding. The first prototype has the working name of “Pavé”. 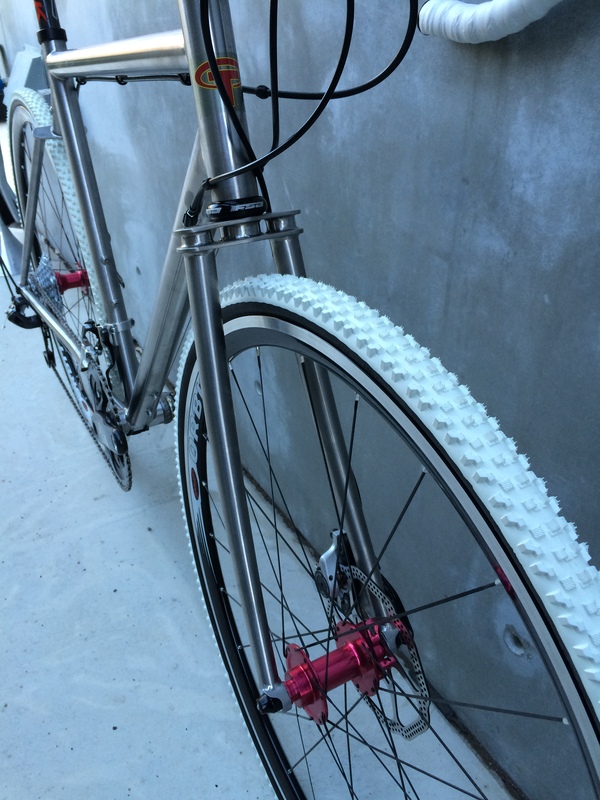 It is a 700C, disc-brake frame made of double butted Carpenter Custom 630 stainless steel. Carpenter Custom 630 is a martensitic “precipitation/age-hardening” stainless steel which has high strength, hardness and “excellent corrosion resistance” good enough for nuclear reactor components,missile fittings, and jet engine parts … which is good enough for us! For those of you who really want to geek-out, the engineering datesheet for the tubing can be found here at the Carpenter site http://cartech.ides.com/datasheet.aspx?i=103&e=54&c=TechAr. 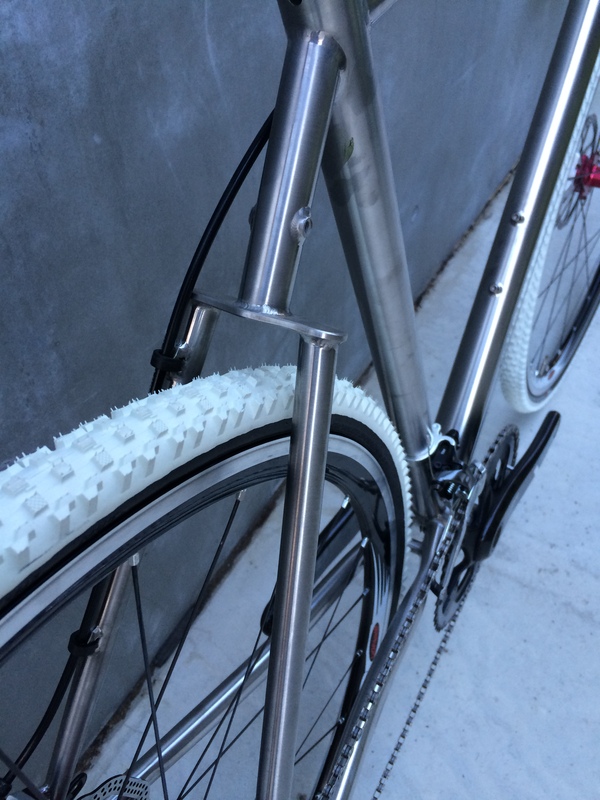 The weight of the bare 56cm prototype frame is 1920 grams and the uncut fork is 924 grams. 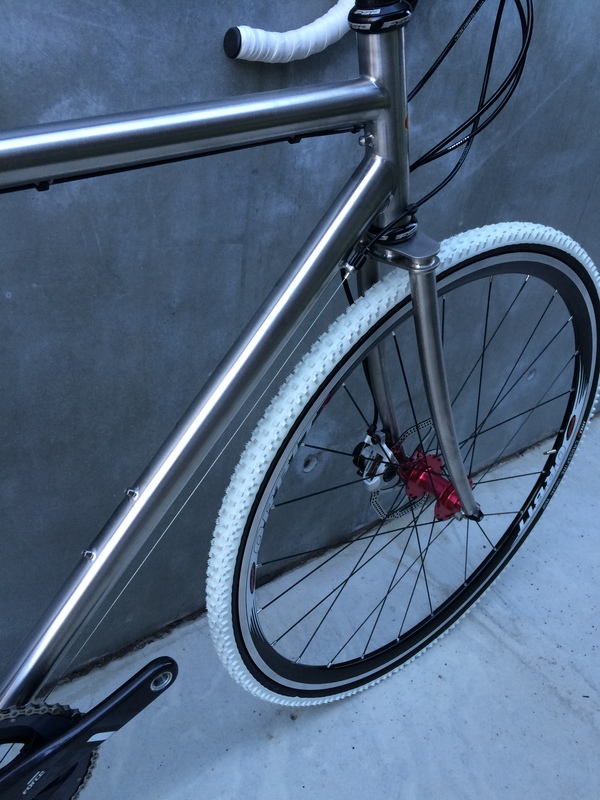 The geometry is laid back-ish with a bottom bracket (bottom bracket drop 68mm) a bit lower than typical cyclo-cross frames. 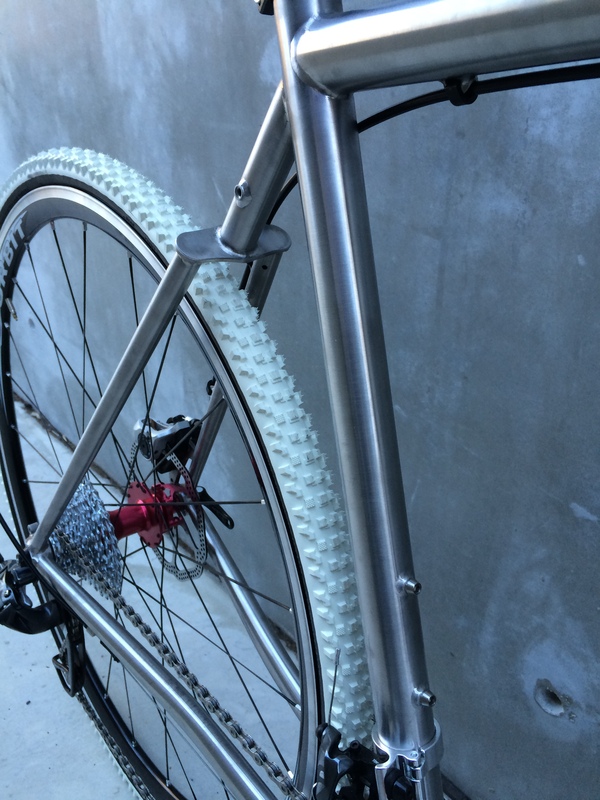 It has clearances to accommodate 45mm wide fenders and braze-on fixtures to attach fenders to. We designed an all stainless steel with a twin plate fork crown that might be the first one of it’s kind ever made. The rear seat stay has a matching single plate mono-stay. 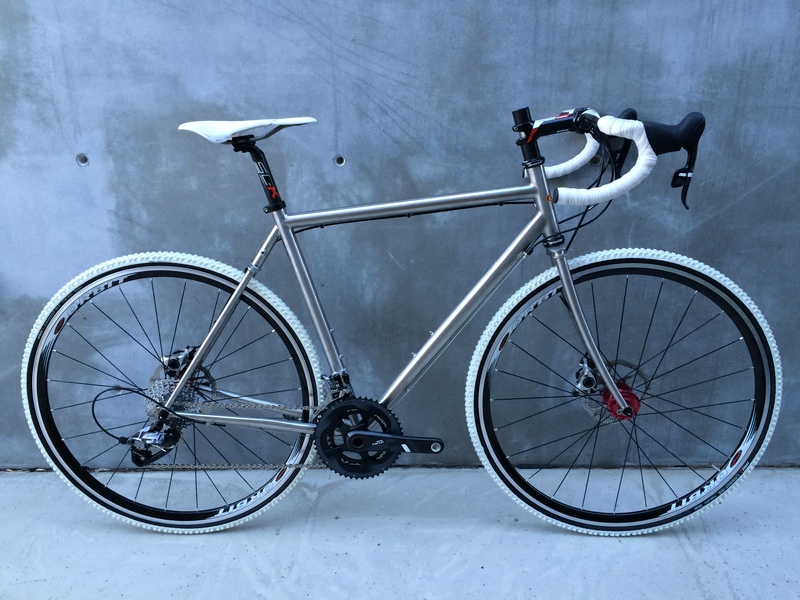 The second prototype is a 650B frame based on the same low trail geometry as our cro-mo 650B Velo Routier frame but made of Carpenter stainless steel with twin plate crown fork as well, disc brakes and 1-1/8″ Aheadset. I will have a blog post with photos next week. The plan is ride both of them hard ourselves and share them out to some local riders. Then we will send them off to a few of our dealers for feedback this summer. If all goes well, we will place a small order for delivery in the New Year. Price has not been finalized but we are hoping frame and matching fork will retail for under $2000 USD. 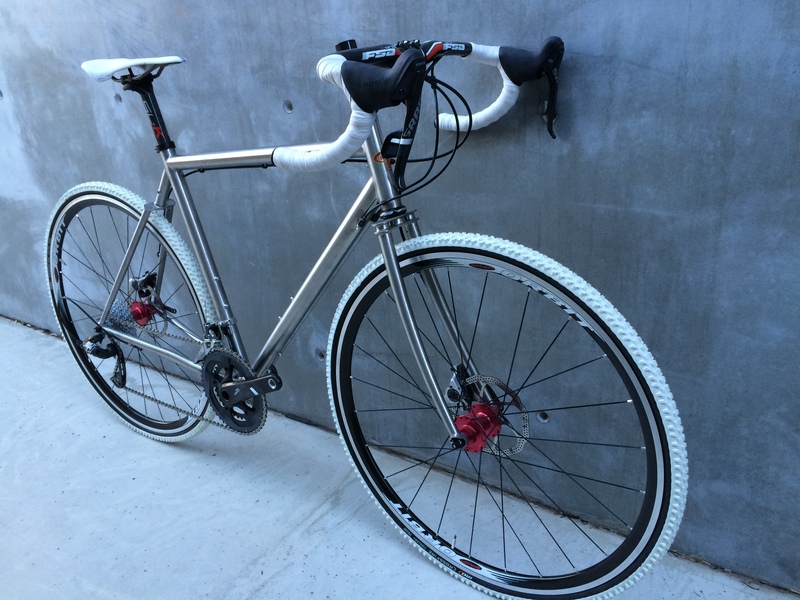 This entry was posted in Progress and tagged 650b Touring Bicycle, 700C Toussaint Pavé Prototype, Gravel Grinder, randonneur frame, Stainless Steel Bicycle Frame by Evan. Bookmark the permalink. Whoa! What an interesting – and dramatic! – departure from the Velo-Routier model! Count me among the intrigued. Wow! What a nicely thought out bike with gorgeous details. This could be my do it all bike. Is it still in the works? Any chance you’d spec low rider mounts for overnight adventures? It looks like I already spy braze-ons for a third water bottle cage! I’d love to take that out for a spin! Actually I was thinking of something like that the fork and seat stay would be so nice and plush. Congrats!